Our iconic grill features one inch thick ceramic walls which allow for better heat retention and even circulation. The Stainless Steel Dual-Action Top Vent allows for faster starting, searing, and heat adjustment. 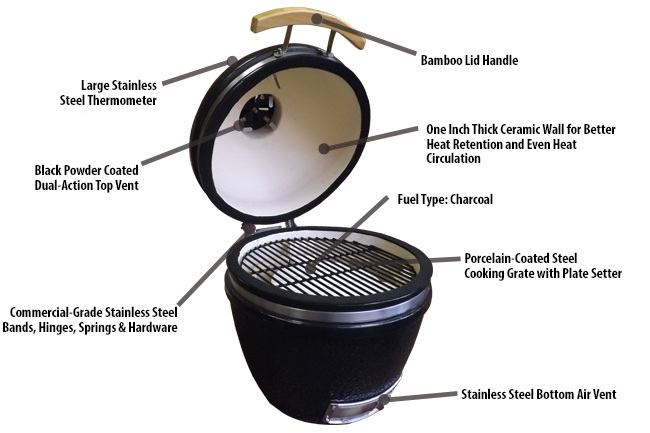 Equipped with a Bi-Level Cooking Grate, easy to read Stainless Steel thermometer, and Commercial-Grade hardware, you will love cooking in the outdoors with your Kamado Grill. Your Kamado Grill will nest perfectly in our beautiful solid Acacia wood table. Hand-crafted in Vietnam, the Acacia wood’s, naturally weather resistant finish will stand up to the elements. The 60-inch wide table provides plenty of workspace and the lower shelf offers storage for your grilling tools, charcoal, and other grilling essentials. The table is also slatted to reduce sitting water and prevent warping over time. Added Value: Duluth Forge Table Nest is Included! Plate Setter works as a heat shield, protecting the food from coming into direct contact with the heat source. Remove the Plate Setter when you want direct heat coal cooking. 960 Square Inches of Cooking Space!